My original idea for the cover was to print a pattern on it and that the registration could shift from copy to copy making each one unique. Turns out the printer couldn't do that, so I wound up doing one solid design. I think I like this better anyway. Here's the inked cover art. And here's the full wrap around cover design. This is the full case (or cover) assembly guide I made for the printer. I tried to make it as detailed as possible so there would be no question about my intentions for the final product. 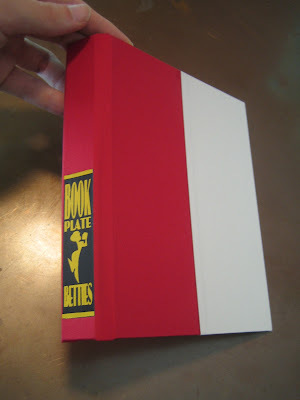 Shortly after that I received this case mock up demonstrating what the final double foil treatment for the spine would look like. So I've got a new book coming out for the San Diego Comic con called Bookplate Betties. 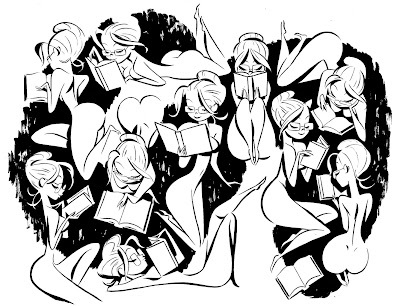 It's a collection of all the bookplate pieces I did for my Belle du Jour special editions, and then some. It's not a book I was ever planning to make but the bookplates came out really well and there were a lot of them, so I figured what the heck, it'll make a nifty book. I'm actually already finished with the book and it's off to the printer. I should have them in my hands a couple weeks before San Diego. I've had some people ask me about self publishing and how I produce a book so I thought I'd show some parts of the process hopefully without getting too boring. First I decided on my size and page count. I went with 7" x 5 1/2" with 192 pages. I wanted to bind the book with cloth this time and my friend Scott Morse gave me this cool idea to print a pattern or imagery on the cloth. 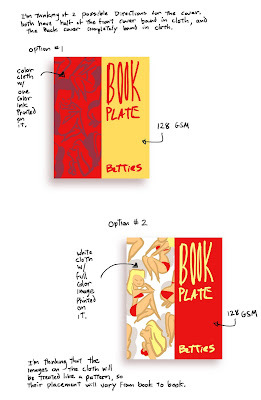 I did a few rough cover comps to show to my printer and ask if it was possible. They said that they could do it, but asked me for some art to do a test. I hadn't designed the cover yet so I gave them these pieces that represented the two different directions I was thinking. I was much happier with the red, which is the way I wound up going. Soon the printer and I agreed on a budget and I signed a contract committing myself to the project. 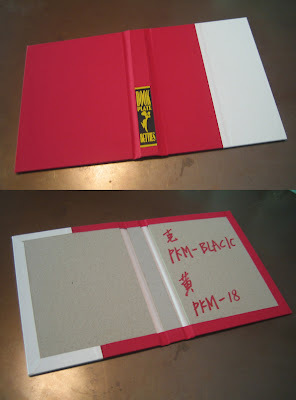 After that the printer took the next step and made a dummy book for me. 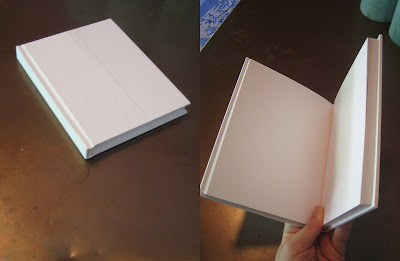 The dummy is a real copy of the book (made with the actual materials) only it's completely blank. 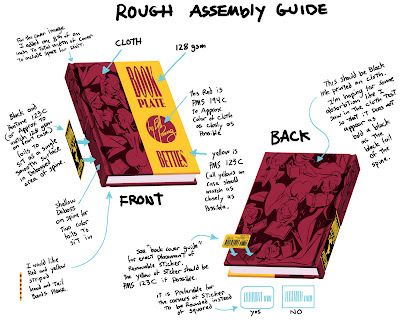 This allows you to hold and feel the book to make sure this is what you want and to iron out any mistakes early before the real book production. Next step, design the cover. Already! I can hardly believe it. I'll be in Paris for a group show at the Galerie Arludik along with my friends Jennifer Chang, Scott Morse and Enrico Casarosa (well, their work anyway, it looks like I may be the only one to attend in person). The show opens June 24th. I'll post more as it develops. For now here are a couple pieces I did specially for the show.